Appoint an agent to manage financial tasks for you. The document should be completed with a person that can be trusted even in the chance that you can no longer think for yourself (durable). 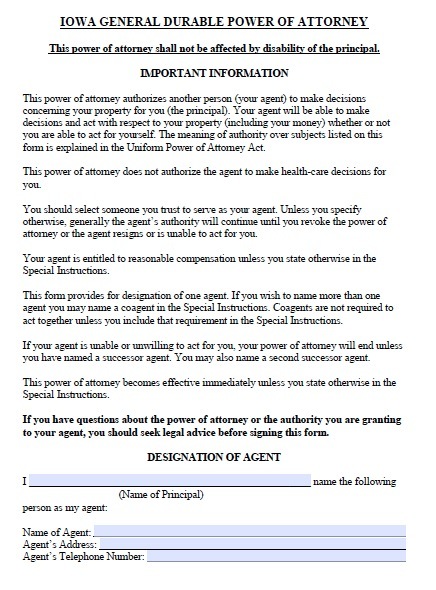 The document must be signed in the presence of two (2) witnesses who are not directly related (also cannot be the agent selected) or a notary public. In Iowa, you can also specify whether the document becomes effective immediately, after a particular date, or after you have become disabled, as designated by a physician. This can be useful if you plan to travel for a long duration because you can plan to have your agent pay your bills, or even manage your property. Otherwise, getting someone else to do routine financial transactions can be convenient because it can allow you to focus on more substantial aspects of your business. Be sure that you have the utmost trust in this person before granting him or her power over your financial affairs.